Funderwall! is a 4-player Bowser Minigame in Mario Party 7. Its name is a pun on the Oasis song "Wonderwall". 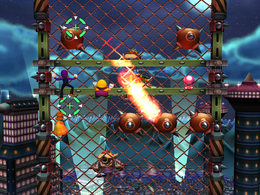 The players need to climb up a large wall made of chain link to reach Bowser. As the players climb up the wall, Koopa Kids are on the other side in hovercrafts with flame throwers trying to burn the players. If the players are hit by the fire, they will be thrown off the wall. There are also several spinning spiked orbs the players need to avoid on their way up the wall. Rules – "Climb to the top of the fence while dodging the fierce attacks of the Koopa Kids!" Advice – "The Koopa Kids use cursors to aim their weapons. Avoid them as you climb!" This page was last edited on August 8, 2017, at 12:34.